Detail of a larger photograph: CQMS Thomas Henry Williamson With many thanks to John Sheen, from his personal collection. From South Hetton, served with 18th Battalion DLI (Durham Pals). Thomas Henry Williamson was born in South Hetton in 1890. Son of Margaret and Andrew, he lived with his family in Haswell until his dad died. Then, they moved to Hawthorn where they were living with his grandparents, Thomas and Elizabeth Armstrong, in 1901. He moved back with his mother to South Hetton, where they appear to be living in 1911. On the 3rd of February 1915, Thomas enlisted 18th Durham Light Infantry (DLI) at Fence Houses. At that moment he was a solicitor’s clerk still living with his mother. He got married to Annie Waiter soon after this, on the 20th of July 1915. She died just a year after the wedding, on September 1916. Williamson enlisted as private number 18/1366, but on the 22nd of May 1915 he was acting as a Lance Corporal and on the 19th of July as a Corporal. 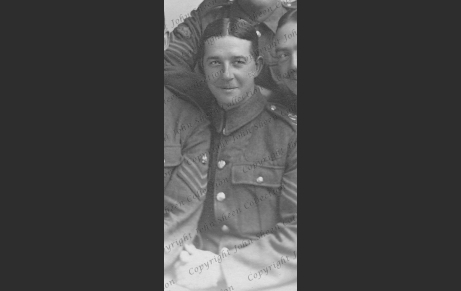 He was then posted to 21st DLI and was acting there as a Lance Corporal again on the 29th of July 1915. Later that year, in November, he was already acting as Sergeant and in January 1916 as Company Quartermaster Sergeant (CQMS). On the 1st of September 1916, he was transferred to 87th Reserve Training Battalion and acting as a CQMS. At the end of the war, he was transferred to Depot DLI on the 7th of July 1918, and once it was finished he was sent to Class Z Reserve on the 6th of March 1919. He remained living in South Hetton, where he died in November 1954.